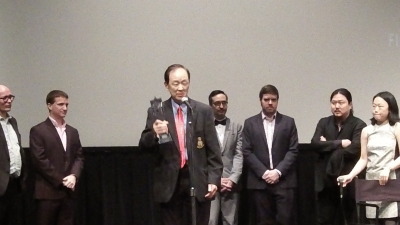 Tuesday night the New York Asian Film festival for 2014 finally ended when Jimmy Wong Yu came to town to accept his Lifetime Achievement Award from Subway Cinema. 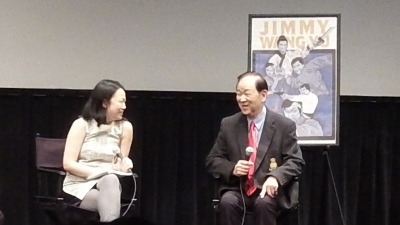 Wong Yu had been prevented from coming to the US because of visa problems in July. 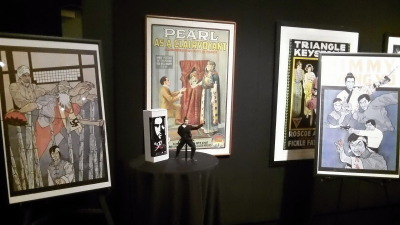 The night began with a reception in the Furman Gallery of the Walter Reade theater. There was food and drinks and a great atmosphere as the crowd picked up where they left off in July. Mondo was eating and drinking. Jarod from Bullets over Chinatown was there as well. 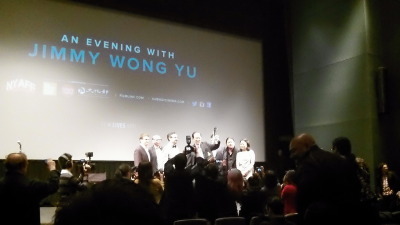 When Wong Yu came in the place went crazy. 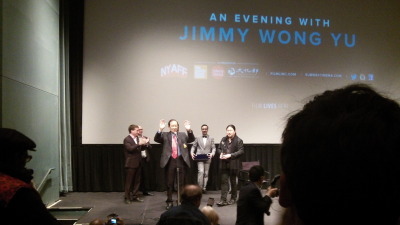 He was shaking everyone’s hand and wading into the crown until the Subway Cinema guys pulled him out of the fray to say a few words. 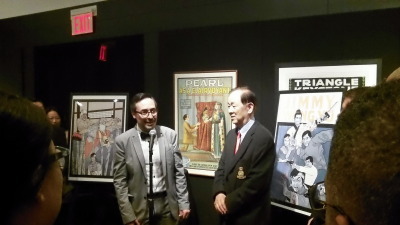 Goran spoke a bit, then the representative from the Taipei Office of Culture and Trade spoke before Wong Yu took the mic to say thank you. When that was done everyone who wanted to could line up for pictures. 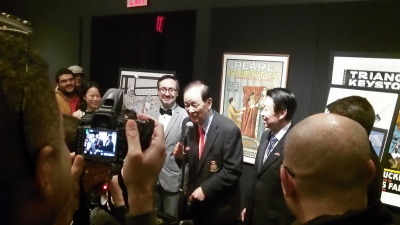 Mondo and I went the lobby to get away from the craziness just as Mr C and Chocko showed up. Chocko brought along his nephew, Brian, who is a newly minted Marine. We then waded back into the fray so that C and Chocko could get some signatures. When the theater opened we all wandered in. We got seats down in front. 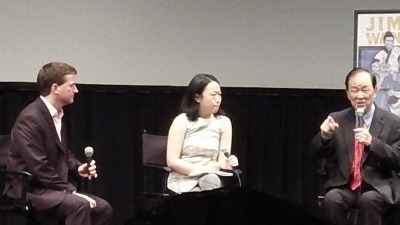 Mr C went off to talk to Kung Fu Bob and Jarod While I talked to Mondo, Chock and Brian-. Then the big show started. 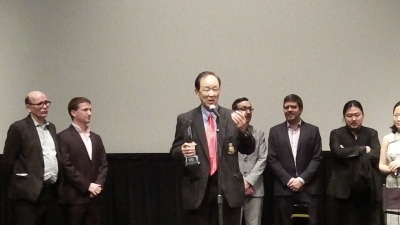 Gavin Smith from Film Comment Magazine introduced the guys from Subway Cinema who then brought out Jimmy Wong Yu to get his Lifetime Achievement Award. 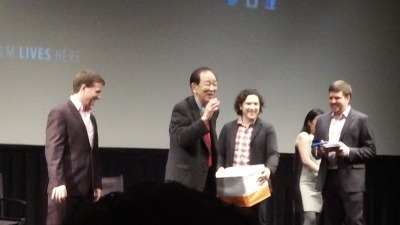 He was gracious and charming as he joked and thanked everyone. When that was done the stage was cleared and we were treated to Wong Yu’s MASTER OF THE FLYING GUILLOTINE (aka THE ONE ARMED BOXER VS THE FLYING GUILLOTINE). For the record it’s a very silly movie. As Mondo said it’s the prototype of every fighting game you’ve ever played with crazy fighters paired off until the final confrontation between the big bosses in this case Wong Yu’s one armed boxer and a blind killer armed with a flying guillotine. The film is 90 minutes of wild action with almost no plot and even less sense. Its silly fun. 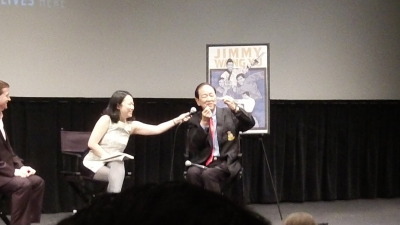 After the film Wong Yu again took the stage and spoke with Grady Hendrix about his life and career. 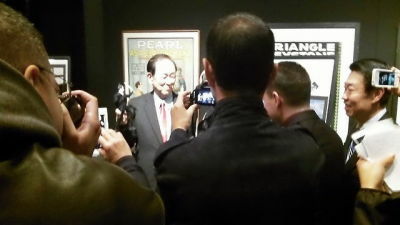 It was a very funny, charming, answering every question straight on or if not straight on then with diplomacy. One gets the feeling that Grady knew way more about his life than he expected so he had to think about a few answers. I’m not going to go into details, partly because I can’t remember all of the details and partly because Mr C recorded it and I hope to link to it. I will however say that he did relate the story about beatimg up Oliver Reed on a film that stopped shooting after 9 days, and he did a magic trick involving making a ring move up a rubber band that was magical. 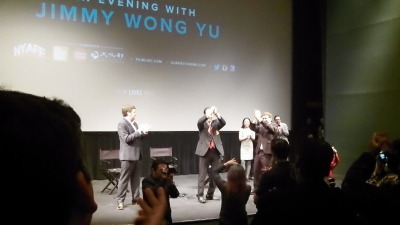 It was a great night and Wong Yu was a classy guy- insisting the Q&A go on past its scheduled end because there were questions- as well as agreeing to sign everything brought his way afterward. 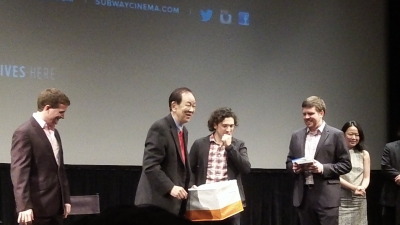 A big thanks to Subway Cinema and Lincoln Center for a great evening. 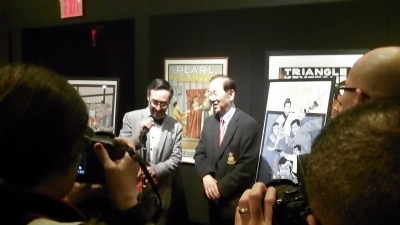 For way too many pictures from the evening go to our tumblr page here. Mr C gives his own report over at his home base PLANET CHOCKO including video here.